I have always had a fondness for lighthouses and love to visit them whenever I can. In fact, I am currently touring New England lighthouses with my son who is an aspiring screenwriter. He has recently written a short story in which a lighthouse is featured prominently and we are in the process of scouting possible locations for a shoot. You can see more about his project and itinerary at his website. You can probably expect some of the New England lighthouses we visit in future blog posts. 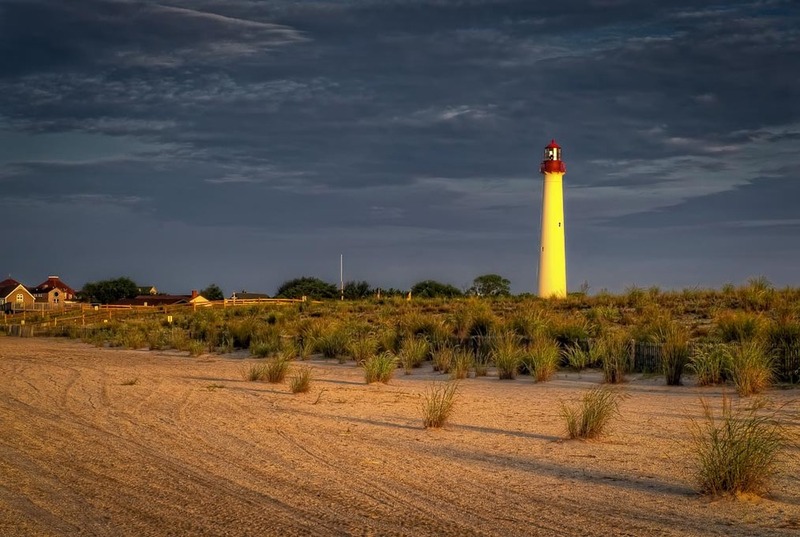 This image is of Cape May Light near the southern tip of New Jersey. I was visiting my brother-in-law who has a place in Wildwood and took my nephew out before dawn to shoot the lighthouse with the sunrise in the background. I hadn't done any scouting beforehand (I know, this should be done whenever possible) and there wasn't a great angle to get both the lighthouse and the sunrise in the composition. Instead, I went out to the beach and was quite pleased with the scene of the lighthouse basking in the soft light of the sun against the blue of the dramatic clouds.